PARIS (Sputnik) - Tensions in Venezuela escalated on January 23, when Guaido declared himself interim president, disputing President Nicolas Maduro's re-election last year. The Venezuelan crisis is the country's internal affair according to the UN Charter, and the international community has to urge Venezuelans to find a solution themselves, Foreign Minister Sergei Lavrov said on Monday when he was asked if the recognition of the self-proclaimed President Juan Guaido by most EU states meant that the current norms of international law were no longer operating. "… when Western countries realise that it is difficult to impose their unilateral agenda on others in a multipolar format, they begin to look for ways to bypass universal institutions such as the UN. They are trying to replace the very essence of international law with certain invented arrangements which they call the "rules-based order. It is now firmly established in their vocabulary. If guided by the international law, in particular, the UN Charter, the Venezuelan crisis would qualify as that country's internal affair and the international community would be obliged to urge Venezuelans to find a solution themselves. " Meanwhile, French Foreign Minister Jean-Yves Le Drian, ahead of a EU Foreign Affairs Council meeting in Brussels on Monday, affirmed that only a new presidential election in Venezuela would put an end to the country's political crisis. "We will reiterate [at the meeting] our desire to respect the rule of law in [Venezuela]. The international contact group that met in Montevideo is a good European initiative with the intention to recover from the political crisis. The political crisis in Venezuela can be resolved only through presidential election, democratic nature of which is guaranteed," Le Drian stated. According to the French foreign minister, such an election should be called by Juan Guaido, the leader of the opposition-controlled Venezuelan National Assembly. This comes after the International Contact Group (ICG) on Venezuela — which is comprised of eight EU and four Latin American nations — held its first meeting on February 7 in Montevideo. The ICG aims to establish a common understanding of the situation in Venezuela and work with national and international actors to find a peaceful resolution to the crisis. Russia and China have also expressed their willingness to participate in the so-called Montevideo mechanism. 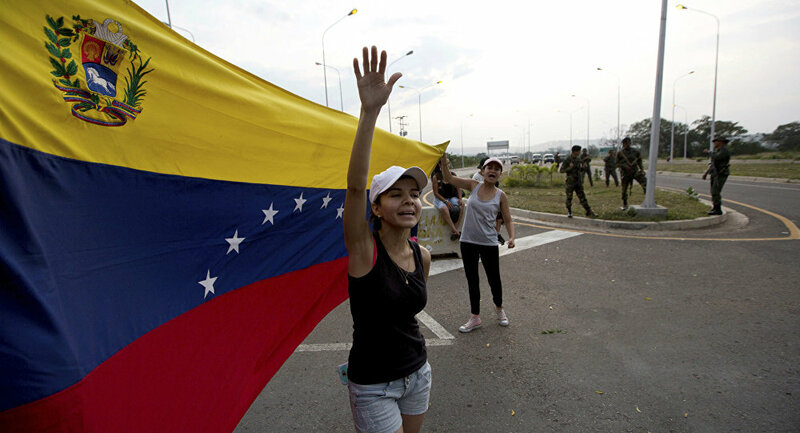 Tensions in Venezuela escalated on January 23, when Guaido declared himself interim president, disputing President Nicolas Maduro's re-election last year. While the United States has openly backed Guaido, the European Union did not issue a joint statement following suit because the motion was vetoed by Italy, according to a diplomatic source. Despite this, however, many European countries have individually voiced their support for the Venezuelan opposition leader. Russia, China, Mexico, among other nations, voiced support for Maduro, who, in turn, accused Washington of orchestrating an attempted coup with Guaido's help.